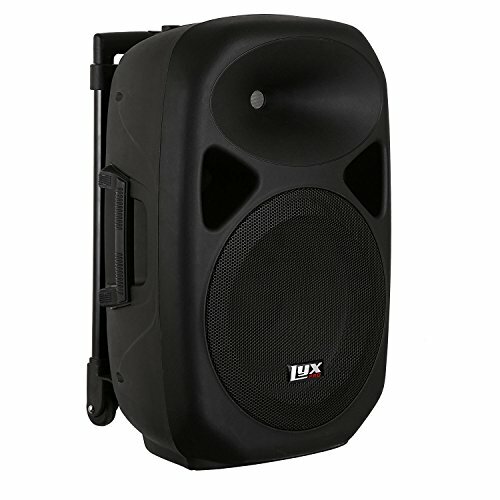 The LyxPro SPA-12BAT speaker's portability and versatility make it perfect for a wide range of live and playback applications, even where there's no power source. It delivers rich, powerful audio from a variety of sources, as a bonus it comes equipped with 2 hand-held mics and a remote control for USB/SD playback. A 4-hour rechargeable battery, built-in SD card slot, USB and Bluetooth connectivity, equalizer, 2 wireless microphones, and super portability make this PA speaker road-ready for any event. Input Dimensions: 25.5" x 16.5" x 14.17"
This product is covered by a limited one-year warranty. Delivers rich, powerful audio from a variety of sources, including Bluetooth USB Flash, SD card readers music and mp3 players, PC, laptops, smartphones, tablets, etc. Bonus! Comes with two (2) hand-held mics and a remote control for USB/SD playback.